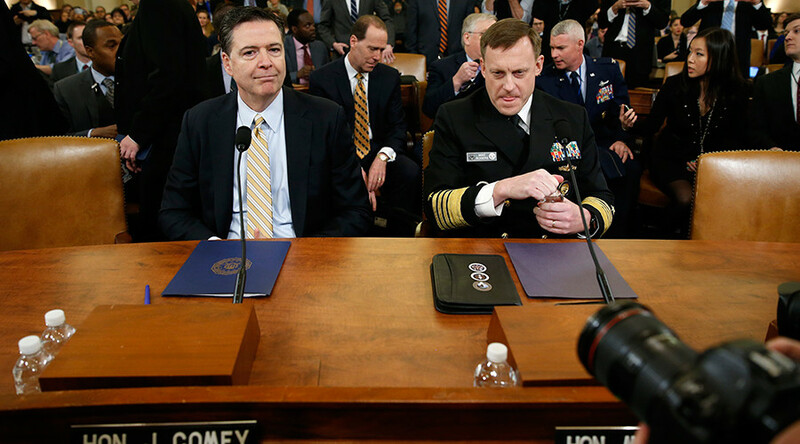 FBI and NSA directors are testifying before the House Select Committee on Intelligence concerning allegations of Russian interference in the 2016 campaign and President Donald Trump’s claims his campaign was spied on. The FBI investigation itself is creating a cloud over the sitting administration, Nunes tells Comey. Comey says he can't answer if the FBI has any evidence of any wrongdoing. "I can tell you that we don't have any evidence," he says, urging Comey to hurry with his probe and ending the hearing. Trey Gowdy (R-SC) is asking Comey (both were prosecutors once) about hearsay and newspaper articles as proof. "The system we respect would laugh you out of court" if one showed up with a newspaper article as evidence, Gowdy says. "How do you cross-examine an anonymous source? How do you cross-examine hearsay?" Comey says private company hired by the DNC (CrowdStrike) provided forensics on hack, FBI didn't access them directly itself. Given it was ten months from the FBI informing the DNC of the initial hack, and the DNC going public with the announcement, what would the FBI do differently, Hurd asks. In retrospect, "we would have set up a much larger flare," and just "kept banging on the door," Comey says, adding that the FBI actions were appropriate under the circumstances. "When was the first time the FBI notified the DNC about the hack?" Hurd asks. "I think it was August 2015," Comey responds, a year before the first releases by Guccifer 2.0 and WikiLeaks. When did the DNC provide FBI access to their computers, Hurd asks. "We never got direct access to the machines themselves," Comey answers. DNC hired a firm that eventually shared their forensics. Though best practice is to get access, "my folks tell me this is the appropriate substitute." Rep. Will Hurd (R-Texas) asks how sophisticated was the exploit used by the Russians to penetrate the DNC. Rogers declines to answer in open hearing. "Tell us why we should care about Russia's use of Americans, helping Russians destabilize our democracy?" Heck asks. "I truly believe we are a shining city on a hill," Comey answers, but cautions that people shouldn't jump to conclusions. "Now we're going to close our mouths and do our work... because the answers matter." Heck finally asks a question - why should Americans care? "I don't think it's in the best interest of our nation for any external entity" to get involved in elections, says Rogers. "This is not likely to stop... absent a change in the dynamic." "What we have seen today is damning evidence of what Russia did," says Heck, repeating prior assertions by fellow Democrats as if they were proven facts and not bothering to ask Comey or Rogers any questions. Rep. Dennis Heck (D-Washington) also brings up the Republican party platform, claiming that Trump's administration is changing established American policy in ways "only Putin himself could approve of."